When Express Scripts (NASDAQ: ESRX) and Walgreen (NYSE: WAG) split up last January, millions of previously-loyal customers found their way to other pharmacies. CVS Caremark’s (NYSE: CVS) retail business has been the big winner, gaining about one-third of those former Walgreen’s shoppers and a big sales boost. Now that Express Scripts and Walgreen have made up (sort of), the pharmacy industry will be battling over these ex-Walgreen’s customers. On this week’s earnings call, CVS management explained why they expect to retain at least 50% of the business. And given what they disclosed, I agree. See the highlights below. Manufacturers should care about these massive market share swings. Some pharmacies are more aggressive at therapeutic and generic substitution. As the African proverb says: When two elephants fight, it is the grass that gets trampled. Since January, Walgreen lost about 22 million customers and about 75 million prescriptions—far more than the company’s rosy projections from last December. See Walgreens is Losing Its Battle with Express Scripts. Sales were hit hard. 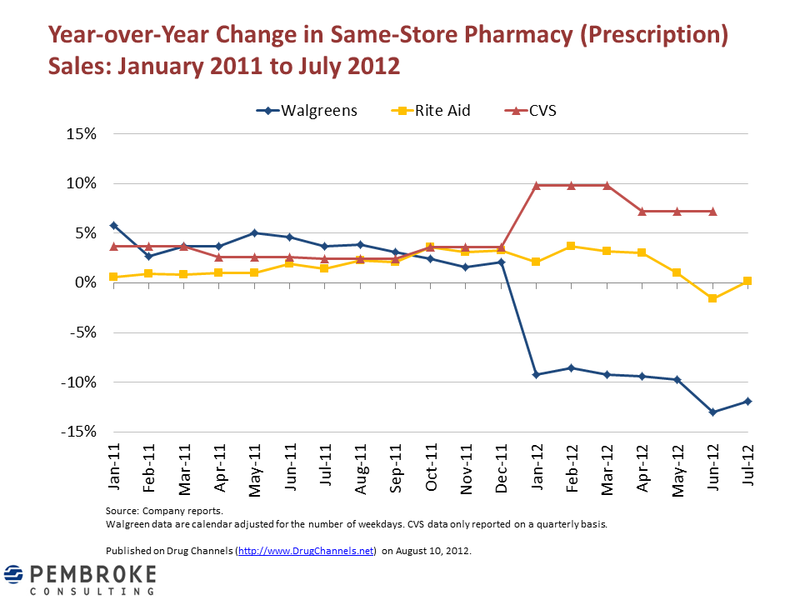 Here’s an updated look at the year-over-year change in same-store prescription revenues at Walgreen (NYSE: WAG), Rite Aid, and CVS Caremark’s retail stores. CVS only reports on a quarterly basis, so I simply plotted the quarterly figure in each month for comparison. Walgreen’s loss has been the rest of the pharmacy industry’s gain. According to a February 2012 survey, 70% of independent pharmacy owners report picking up business from defecting Walgreen’s customers. (source) Even Rite Aid has been able to capitalize on the bonanza, per Rite Aid: Smart or Lucky?. On this week’s earnings call, CVS Caremark Larry Merlo made a point of highlighting how much money Walgreen put in CVS’s pocket. 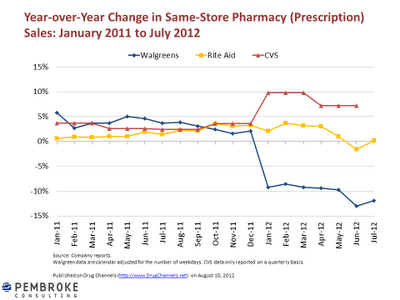 CVS gained 6.5 to 7 million new prescriptions from former Walgreen’s customers. If CVS retains 50% of these customers, it estimates an additional $0.05 in earnings per share (net of investments in marketing and promotions targeted at those customers). That translates into more than $60 million in incremental profit. 70% of Express Scripts customers are within two miles of an existing CVS store, and 90% of are within five miles. CVS knows “the value of each of those customers,” i.e., total spending, so they can focus on wooing the best ones. Of course, Walgreen also knows these customers and will be trying to lure them back with cash for prescription transfers. Walgreen will also soon launch its own loyalty program to compete with CVS' ExtraCare and (to a lesser extent) Rite Aid's Wellness+ programs. Presumably, their new best chums at Boots can teach them a few lessons. The Boots Advantage Card is a very successful loyalty program in which customers earn points on purchases for redemption at a later date. (Users earn 4 points, worth 1p each, for every £1 spent.) It has 17.8 million members, including an incredible two-thirds of all adult women in the UK. Blimey! Everyone believes they can win on service. But if history is any guide, expect significant price deals and discounting. Nothing says “I want you back” like cold, hard cash. P.S. The Art of Woo is an actual book, co-authored by my friend Mario Moussa. Check it out! In pharmacy wars, the customer can win big. By trying new places, they may find a pharmacy they x's etc.